I’m just a writer and I write my own travel tales but I’m not much of a traveler… not just yet. I hope I will be one day though. I guess there’ll be nothing like exploring your own country and its beauties. 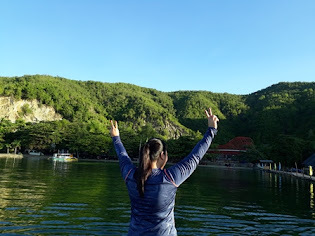 So here let me narrate to you a chunk of my most recent travel tales that took place in the northeast part of Mindanao, Surigao de Sur and their popular tourist attractions beginning with the ENCHANTED RIVER. From where I live, it took us approximately 4 hours using a private vehicle before we finally set foot on the place. You’ll just have to brace yourself though for that 15 kilometer unpaved, roller-coaster like road you’ll have to go through while entering Enchanted River. It is rather a little annoying but it pays off and I don’t think there is an alternative route available for use. Don’t worry it’s just a teaser. It’s nothing risky at all otherwise; they won’t let the goers use that route. So what to expect in Enchanted River? An entrance fee of 30Php/person will be collected as soon as you get in. Cottages and huts are available for any size of groups. I am just not quite sure if snorkeling and diving is offered but I saw sets of diving equipments on one corner that are maybe for rent... or maybe not. Sorry to frustrate you on that but if diving is not your cup of tea; you can always go for beach hopping instead. It is what our group did actually. 5-seater boats is all they have so if you go in a group of more than 5 like us, you will obviously need to get two or more boats. Rent is 100Php/hour and that will be up to you and your group to decide how long you want to stay out in the water. On your way back, you may want to try that one stop sporting its large fish pens where you can go watch or swim with live huge fish of different types and colors. The place also has a local bar and a restaurant as well as rooms for rent should you wish to stay there for the night. They also have souvenir shops where you can get fairly priced trinkets – most are made of different seashells. It is nearly lunch time when we got back to our rented cottage. Everyone was exhausted and hungry so we didn’t waste any more time. Shortly after taking lunch a siren echoed the entire place. The clock stroke 12 and its fish feeding time! It is a routine you don’t want to miss if you are to visit Enchanted River for the first time. It is where you get to see brightly colored fishes coming out from the water to catch food tossed out their way by the guests. We were there too… not to feed the fish though but to take pictures… lots of them. Above are few pictures from our beach hopping activity. That’s it for our Enchanted River experience. Next stop: TINUY-AN FALLS. That’s up next on D’TOUR. Stay tuned.